One of the most impactful business books I read as a young executive was Who Says Elephants Can’t Dance? by Louis Gerstner, Jr. about his experiences while transforming IBM in the 1990s. After my former boss and mentor, Michael Rapino, recommended it to me, I read the book over and over again. In fact, I read it so many times that my quoting its passages became a running joke in our office. The story moved me. IBM, the once proud giant of American ingenuity, had fallen on tough times. The internal culture of the company had become slow and stagnant with an undercurrent of cynicism. When Gerstner took over he inherited the monumental task of releasing the negative energy and allowing the healthy company inside to emerge. The idea of finding a gem where others saw a tired, old behemoth made my heart dance like the elephant in the book’s title. I’ve found this analogy helpful in my own understanding of how to deal with stagnant, negative energies in the body. Like IBM, sometimes it feels like we’re a lost cause. Trapped under the weight of a barrage of negative feelings, it seems that no matter what we do we can’t get beyond the thoughts in our head. They hold us back like a particularly toxic department in a company whose employees spend time gossiping at the coffee machine, writing nasty emails, and opposing any form of innovation or new idea. Every company, school, and organization has these energies … and so do our bodies. The answer, I’ve found, is that these hidden feelings often come from our internal organs, which store these unresolved emotions. Eastern philosophy of the body teaches that each organ stores a certain emotion, and that part of maintaining a healthy body is understanding and working with the organ to gently release its pent-up emotion and restore it to a state of joy and ease. My teachers equipped me with a toolbox that I want to share with you today. Get to know your organs. As I began to learn about my body, I was amazed at how little I knew about its function … or even its layout. School had taught me a lot about “facts and figures,” but had really underprepared me for the real-life skill of caring for myself. That changed when I met my teacher Taoist Grandmaster Mantak Chia, who taught me to start by getting to know my body. Master Chia equates the value of knowing the map and function of our bodies to investigators trying to solve a mystery. If we don’t know who’s doing something, where they’re doing it, and why they’re doing it, we’re helpless. But when we know who, where, and why, we’re equipped to take the appropriate action. This process is the same when caring for our bodies. If we take the time to understand which organ is responsible for which emotion, where the organ lives in our body and why its function is important, we have a starting point for achieving the health and wellness we desire. Here’s an image I use as a reference point in getting to know the internal workings of my body. Breathe. There is nothing more important to our bodies and our emotions as the breath. Beyond the obvious necessity for oxygen, the breath plays an important role in regulating our emotions. First, as a messenger, the breathe tells the body that all is well. When we breathe deeply we tell the body it can relax. Why? Think about what happens when you’re facing a threat or a crisis. How do you breathe? Long and relaxed? No, when we’re under attack, whether real or perceived, our breathing becomes more frequent, shallow and frantic – and the body understands this as a sign of stress and responds accordingly. On the other hand, a long, deep breath is a very different sign for the body – a sign that all is well, inviting the body to relax. The other function that long, deep breathing plays in regulating our emotions is through the relaxation of the diaphragm. Take another look at the body diagram above. Do you see how a constricted diaphragm restricts flow and traps the organ energy in the abdomen? This stagnation causes the emotion to fester, grow, and become increasingly toxic. My teacher Guru Singh taught me to focus on breathing deeply and expanding the diaphragm, causing it to stretch and relax and allow the emotions to release. Think of this as internal yoga for your organs – creating space for health, joy, and wellness to flow in our bodies. Deep breathing is internal yoga for our organs – creating space for health, joy and wellness to flow in our bodies. Chinese Herbs. One of the primary benefits of Chinese tonic herbs, as taught to me by Herbal Master Ron Teeguarden, is that they promote proper organ function. The energy of the herbs interacts with our organs, stimulating them to turn on, activating their natural flow and moving the energy trapped inside. Just as we hop on a treadmill in the morning to “get our juices flowing,” the herbs do the same for our organs. And when our organs are flowing, the emotions in them flow too. In this way, flow is a natural disposal system for old emotions to leave our system. 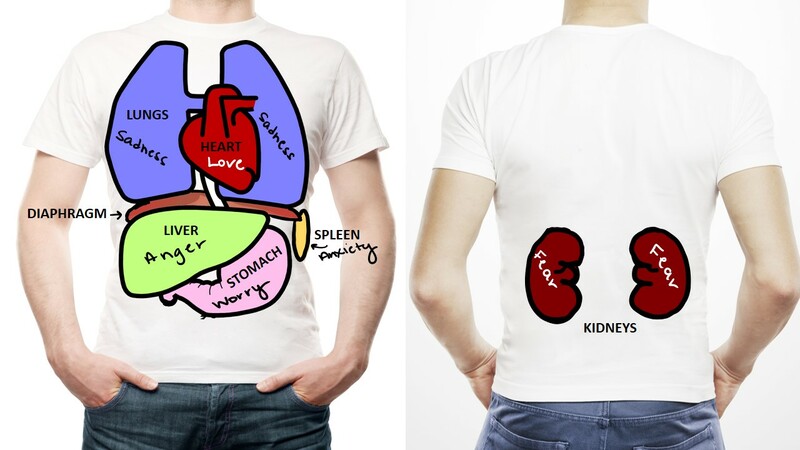 Send love to your organs. Another lesson Master Chia taught me is to smile at my organs, literally. 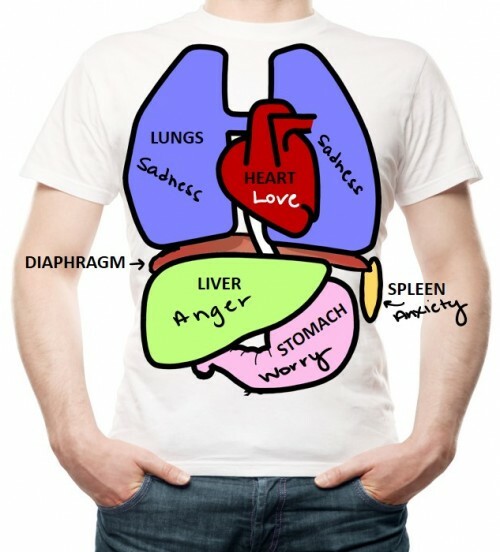 Once you know where your organs are and what feelings they store you can direct messages of love and kindness to them. Watching Master Chia meditate is contagious. He sits with a big smile on his face, sending love one by one to his organs and then to his entire body. Meditation. The final step for me in comforting pent-up emotion in my body is a meditation that combines all we’ve discussed above, which I’d like to invite you to join me in practicing today. Let’s start by looking at the body diagram and refreshing our understanding of the body. With that image fresh in our minds, sit comfortably, close your eyes and breathe … focusing on the diaphragm. Just relax and breathe for a few minutes — long, deep breaths — feeling the diaphragm expand and contract, moving up and down. If your diaphragm is tight (most of ours are), try adding the message “you are safe” and feel how your diaphragm responds. This always helps me relax. When you’re ready, place your hands on your lower back and focus your awareness on your kidneys. They are the organs that store fear. Smile and send them thoughts of safety, stability, and comfort. Breathe deeply and imagine the kidneys relaxing into the love you’re sending them and feel the fear slowly melt away. Next move your hands around to the right side of your abdomen to the liver, which stores anger. Become aware of the liver and feel any anger that you’re holding. Don’t grab onto the anger, just be aware of the feeling. Breathe deeply and smile into the liver with the message, “All is well. I understand you. I appreciate you.” Breathe a few times. When it feels right, move your hands to the opposite side to the spleen, which is the organ of over-thinking and anxiety. Breathe deeply, smile at the spleen and send it messages of confidence and safety, give it permission to let go and settle down. Then move your mind and your hands to your stomach. This is where worry lives in our bodies. Can you feel it? Smile to your stomach, breathe really deeply … do it a few times because we all have a lot of worry to release. Say, “It’s okay. I hear you. We’re in this together. All is well.” Really feel these messages as they travel to your stomach. Invite the worry to move on. Place your hands on your lungs. Acknowledge the sadness that lives there. Breathe and fully expand your chest. Allow yourself to just feel whatever feelings you become aware of. Be gentle. Say, “I love you … I’m sorry for your pain … I’m here for you.” Breathe some more. And finally place both hands on your heart – give your heart a loving hug. This is where love and joy reside. In this meditation, we’ve stimulated all the stagnant, dormant energy of fear, anger, anxiety, worry, and sadness and we’ve slowly brought it to the surface, to the heart; and now, with a deep breath and a smile into our hearts, we convert those emotions to the energy of love that we send back into our body and out into the world. Breathe and feel the love radiating to every organ of your body. Feel it in your kidneys and in your liver. Breathe again and experience love in your spleen. Breathe once more and savor the warm sensation of love that replaces the feelings of worry and sadness in your stomach and lungs. For a few moments just enjoy the experience of being loved from the inside out. The story of the turn around of IBM taught me an important lesson in business — that we can change the culture of a company and allow even rigid old elephants to dance. I’ve learned the same is true in life — that we can change the culture of our bodies and allow our organs to dance in harmony with the love song of life. This week I invite you to breathe deeply and frequently … to connect again and again with the feelings of your organs … to release the fear and pain … and to allow yourself to be deeply, truly loved. this was a great blog, as always! thank you for dealing with this important subject! And science will back up this strategy. Beautifully done! Thank you! I am not sure how you keep doing this, but you have once again hit right on something that I needed this very day. I love that about you! This will take much practice, but I followed with you through the process, with many tears, of all varieties. I am grateful, as always, for you, and your ability to be so clear,concise and loving in your teaching! You are a blessing! Love, Light & the Biggest of Hugs to you! P.S. I am now more than half way through ‘And I Breathed’ & love it more & more with each page! Thank you for sharing your journey! Big Hugs of Love. It is interesting that, in the diagram of the tee short, there is only one positive emotion. Oddly, people are much more able to list and describe problematic emotion names, rather than the more optimistic ones. Beautiful … loving your organs …. I would have never thought of this! Thank you Jason!! What a wonderful message! This makes a lot of sense to me. I’ve lived half my life in various forms of chronic pain. When you’re in pain, your breathing becomes short, restricted, shallow and rapid. You don’t even notice it happening. Muscles will tighten and tense, again without you really being aware of it. After I had my surgery, I knew what to look for – and to make sure I took long, slow, deep breaths, gently scanning my body and finding the spots that were tight and inviting them to relax, to reassure them the pain would ease and pass. It helped so much. The first few days with me not being able to do much other than just listen to music and breathe, gave me the opportunity to really focus on my breath and how it affected my body. I never really paid that much attention to my body for a lot of years. I learned to block out pain to cope with life. Bombarded with the slogan of ‘no pain, no gain’ (which I really, really hate!) throughout my life both physically and emotionally, I ignored warning signs and kept going until I crashed. As seen from the really nice drawing above (not too gross…that stuff turns me off learning about the body, although I will say with all the zombie stuff my kids watch on tv I’ve started to become a little less squeamish than when I was younger, lol! ), worry affects your stomach. After having started my spiritual journey and meditating, learning to let go of my stress and worry and live in the moment, guess what? My stomach is much better, and I’m able to tolerate foods that in the past made me sick (not all foods yet, but many more than before…slowly getting there!). So maybe this is why when you first start doing yoga that you feel so emotional or cry afterwards! I hear this is common. Wow!!! This is great! Definitely going to try it! Thanks Jason…your words – as always, inspire and ignite. This is a beautiful meditation – and exactly what my soul was calling out for today. Breathe Chinese herbs emotions energy Guru Singh IBM jason garner Louis Gerstner love mantak chia meditation Michael Rapino organs Ron Teeguarden self love Who Says Elephants Can't Dance?